SUZI: You wanna preach this Sunday? ANDREW: You know I think people have heard my voice a lot lately, so I’ll pass. SUZI: Well, from what I understand you have preached a mighty good word! But Sunday is the annual meeting…it has been my practice to weave the rector’s report into the sermon on the Sunday of the annual meeting….and it is going to be hard for me to do an annual report because I haven’t been here that long. ANDREW: Oh, I see. Well, what would be helpful? What do you need to know? SUZI: My preference on these Sundays is to connect the scripture to the work of the congregation; so the gospel for that Sunday is Jesus saying…"The Spirit of the Lord is upon me, because he has anointed me to bring good news to the poor. He has sent me to proclaim release to the captives and recovery of sight to the blind, to let the oppressed go free, to proclaim the year of the Lord's favor." Etc., etc. Then Jesus says, "Today this scripture has been fulfilled in your hearing." ANDREW: Oh, right. Yes. And Corinthians talks about being individual members of one body and all the gifts of the spirit, and each is a major part. SUZI: Well, maybe this is how we fulfill what we hear. For me, this means WE are the BODY of CHRIST in the World. So, tell me, get me up to speed, how has St. A’s done this? ANDREW: Oh, Suzi. You’re asking me to gush about a church I adore, right? SUZI: Maybe? I am just so curious, so…gush on! And Suzi, this place has brought Good News to the world this year in everything that we have done. So many people here have the gifts that Paul speaks about in Corinthians, and as their pastor, it is my joy to see them move in their gifts and talents. St. Augustine’s is a parish that looks for the spirit of God at work in the world—and they go in and join that work. St. Augustine’s is a community that values one another, that embraces change and really believes that our loving actions in the world, change the world. St. Augustine’s is a place that is deeply committed to sharing their gifts of time, talents and treasures—as well as their leadership, hospitality, and prayers. SUZI: Well, it seems like the church both practices action in the world, and spends time developing their own spirituality and the relationships around them. ANDREW: Yes, that’s right. We have a church that values being together, even with differences, and they are used to doing this so beautifully. We gather to do fantastic ministry here and in the world together, and to break bread and celebrate life. We gathered to celebrate new births, and marriages, as well as we gathered to grieve—Bill and Dee Doughty—pillars of this church—and other saints in light, too. As you know, this church has also sent off a well-loved pastor and her family, and so church transitions—both joyful and sad—have been huge this year. SUZI: Tell me about some of the things St. A’s did together this year. ANDREW: Well, this past year, we met nearly 45 new people, many of which have made St. Augustine’s their new home. We saw 2 members Confirmed, 7 received into the Episcopal Church, 1 reaffirmation of faith, and 2 had their very first Communion at Bishop Lee’s visit. We also baptized 4 people into the Household of God in 2018. Many of our newcomers come to know Carol Telling, or Mary Whiteley, or Kathleen Todd as they leave bread on their doorstep to welcome them, and plan beautiful receptions to recognize the new members among us. SUZI: Tell me about what has happened on Sundays. ANDREW: Oh, so much. I will probably miss some things, (for which I am sorry) that I will remember tonight at 3 am, but here is what comes to mind. First of all, it takes the hands of many people using their talents and gifts to bring us into worship on Sunday. We have a master of ceremony, Mary Senn, who helps to train and coordinate all these rock-star people who lead on our altar. We have acolytes, book bearers, chalice bearers, readers, Eucharistic ministers, an incredible altar guild, talented ushers, and so many others. And who can forget our choir and musicians, and Martin, who lead us to worship every week? We celebrated 52 Sunday services in the Nave, as well as 13 Beach Church services. We sang songs about the great community of saints in the faith who have gone on before us, as well as we have been challenged in our faith to realize how loved we are, and how much God loves this world—and how we are called to serve this world. SUZI: Well, it is clear that a lot happens in worship and it takes many hands. ANDREW: That’s right—and I hope people know that we are always looking for more people to help with various tasks, too. We will put something in the PLC soon. SUZI: So, what do you do for Formation on Sundays? ANDREW: Let me tell you, we have such talented people behind the wheel of our children’s formation. I know that they are committed to their work, to our children, and it’s incredible—and not to mention—our parents are so helpful and involved, too. Charley Bowe agreed to oversee our Godly Play and Godly Quest programs after John White relocated to Indianapolis. Charley has done a great job of getting leaders trained and recruiting volunteers and parents. Of course these programs are Montessori based, and are tailored for children ages 4-12. Their lessons are the same or similar to those used in church, there are snacks, and it is a huge attraction for some of our families. These two groups meet every week during Coffee Hour—except on the first Sunday of the month—and on major holidays. SUZI: I noticed the younger children being led out right before the sermon. ANDREW: Yes, they are headed to Children’s Chapel, which is led by Linda Moser. Children’s Chapel is during a portion of the service and is for those who might need room to wiggle and learn in a different way than in regular church. Linda has served in this beautiful way for many years, and she is so very talented at it. Stacy and Mike Shedivy, as well as Sarah Fields, make themselves available to our tweens and teens leading the Feasting on the Word group, and offer a safe platform for open discussion on all matters as they relate to growing up and figuring things out. And they bring donuts. Suzi, I can’t wait for you to see our Christmas Pageant! This is overseen by Janice Hurley, and she also helps with our Children’s Journey to the Cross as well. 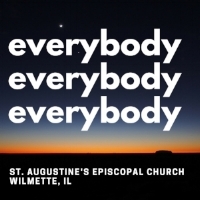 And this summer you will see the churches of Wilmette come together for an ecumenical VBS, and Jen Curchin and some others from this parish lead this for our children. Jen also oversees our nursey staff. SUZI: That sounds like a lot, Andrew. What does it look like for Adults on Sunday or otherwise? ANDREW: This past year the Rev. Dr. Frank Senn led a beautiful study on the history of the Prayer Book; and Frank also led a study on Motoricity and our senses in worship. I led an interesting series on the Enneagram. SUZI: Oh, how fascinating, I am interested in the Enneagram. ANDREW: It is a great tool to have as we seek to better understand ourselves and those we love and see God at work in our strengths and weaknesses. Our Equipping the Saints group, as led by Sam Love and Sue Carlson also meets on Sundays. This group continually invites us to examine the ways in which we engage our world on matters of race and culture divisions in our society. And then of course, there is Coffee Hour. SUZI: My goodness, I had no idea so much happened on Sundays. What happens outside of Sundays? ANDREW: Well, this year we revisited home groups again and formed Cottage Groups. We found a wonderful crew of volunteers who agreed to open their homes for gatherings every 4-8 weeks during the program year with the objective to get to know others from the church in a more comfortable setting. But before summer, way back in January, we kicked off the year with a weekday Christian Formation and Confirmation Prep program called Canterbury Consciousness where we spent six moths talking about types of prayer, spiritual disciplines, the faith, the Eucharist, and the history and traditions of the Episcopal Church. We made healing oil, prayed Compline, baked communion bread, and made faith formation fun. SUZI: That does sound like fun. Anything else? ANDREW: In February, we welcomed the Rev. Kathie Adams-Shepherd, former Rector of Trinity Church in Newtown CT, a parish directly affected by the school shootings at Sandy Hook. Kathie helped us unpack how we can be a resource for one another and our surrounding neighbors in such tragedies. This led to our reaching out a week later to St. Mary Magdalene Church in Coral Springs, FL the day of the Marjorie Stoneman Douglas High School Shootings. When they found out that one of their own was killed in the shooting, this community gathered to write cards, send prayer shawls and candles, and walked with them through this first year. SUZI: What a beautiful connection to that parish and share their grief. ANDREW: This was the impetus for the congregation and clergy becoming involved with the Washington DC and Chicago marches advocating for greater gun safety. They have been in our prayers all year. SUZI: I was talking with Sam Love about Education for Ministry. As a graduate of that program, I was delighted to hear that St. A’s has a branch here. ANDREW: Absolutely, Sam Love and Debbie Buesing do an amazing job of growing and leading this faithful group. It is an incredible 4-year platform for spiritual formation, biblical education, and fellowship. My experience in EfM led me to go to divinity school—I really enjoyed it. SUZI: Andrew, tell me about some more ways that St. Augustine’s reaches out to the community and the world. ANDREW: For years now, St. A’s has had a presence at the Chicago Pride Parade, and this summer was no different. I have told the congregation what a joy it is to see people surprised and caught off guard that the church shows up with love and support—and how much that reflects their love of the LGBT community. I am so thankful. Sarah Fields made a beautiful banner for us to carry and it was a beautiful day just hugging people and telling them God loves them. SUZI: What an important message to share. How else does St. A’s show their love? ANDREW: The Good Samaritans keeps tabs on situations in the life of the church and community where some kind of extra support might be needed. Whether it is a ride to an appointment, a casserole, groceries, anything really. These people take great care of anybody who is referred to them. Julia Joehl oversees this group of hospitable volunteers. The Prayer Shawl Guild gathers periodically to have fellowship and to knit or crochet the beautiful shawls that we bless and send to people. It is a beautiful outreach that has touched so many. Mary Ellen Davis, Carolyn Eby, and Kristie Webber oversee this ministry. Family Promise is a North Shore based ministry that partners with churches in the area to house families in transition from being homeless to being housed. Guests come and stay a week with us on cots, and volunteers stay the night to offer care, and meals. We host 5-6 times a year, and Julia Joehl and Kathy Gander coordinate this with other faithful volunteers. The Christmas Basket ministry, as led by Hilary Kennedy, brings families in need to our attention and the chance to adopt them for Christmas. St. Leonard’s is a comprehensive ministry for released prisoners that we have supported for some time; and just recently our parishioner Katie Gonzalez began working there. This season, Katie asked the church to help out with an urgent need for blankets—and per usual St. A’s style—people went above and beyond and brought maybe 4 carloads of blankets and coats and more to help this ministry. And, perhaps what we have come to be so excited about, is all the ways in which we give money to various organizations around Chicago through our grant program—but I will save that for Sunday’s meeting. SUZI: Unbelievable. What time, talent and resources this takes. ANDREW: Oh, absolutely. We have an incredible team of faithful stewards who help us manage everything from funds to our buildings and grounds. We have three co-treasurers, Gray Curchin, Bruce Caris, and Tina Janetzko, as well as a fantastic Bookkeeper, Athina Sato, who keep us in good shape. This past year our endowment committee was led by Gray Curchin, Chris LaRosa, and Dan Shedivy. Ever faithfully, our counters: Mary Jacobson, Jerry Todd, John Whiteley, Hilary Kennedy, and Anthony Green come every Monday to count the collection plates and make deposits. We had a fabulous stewardship team this year, chaired by Meghan Murphy Gill, and included Karl Anderson, Gray Curchin, Bruce Caris, and myself. I can’t forget Theresa who has knowledge of all these things and keeps us so very well organized. And, this year a Buildings & Grounds Committee came together, as chaired by Mark Farrell and Greg Witt. Faithful stewardship of all resources—including our building—are of tremendous importance here. SUZI: Now I know why I am so excited to be here. ANDREW: Suzi, its an amazing place, and I couldn’t be happier here. SUZI: So Andrew, are you preaching this Sunday?